Not enough time to write!!?? We spent an incredible three days at the Cape with Jesse and Joy and families…..only wish Jennifer and her family could have joined us. We spent one day at Breakwater Beach in Brewster and one at Mayflower in Dennis. We went mini golfing and ate seafood. At the pond at Joy’s campground the kids fished and were entertained by three prehistoric-looking huge snapping turtles. 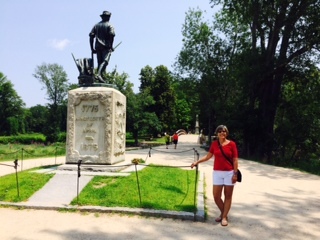 On the way home, Steve and I revisited the North Bridge at Concord, MA, where the Revolutionary War started on April 19, 1775. He convinced me to tour the Old Manse, the house that overlooks the bridge and the surrounding field, whose occupants were witness to the birth of our nation. Bronson Alcott, Henry David Thoreau, Margaret Fuller, Nathaniel Hawthorne, and Ralph Waldo Emerson, were some of the famous philosophers and writers to either live or spend time there. The Hawthornes rented the house, which did not deter Sophia from etching with her engagement ring poems into the soft glass of the windows. We spent a week in CT babysitting Tyler and Haley (Lucas was in VA). While the kids were at day camp we took a few day trips. At East Haddam we crossed the swing bridge over the CT River just to see the old Goodspeed Opera House–and got stuck there when the bridge opened to allow a boat through. An amazing feat of engineering. 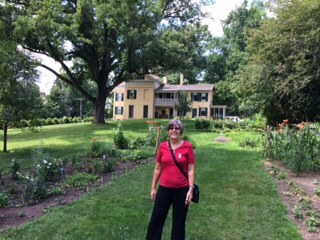 We toured the home of Mark Twain/Samuel Clemens in Hartford. We loved, loved, loved the house. His writing desk is in the same room as his beloved billiards table. He ended up turning his desk away from the table to face the wall–otherwise all he wanted to do was play billiards. I can identify with that. Another day was spent at the homes of Emily Dickinson and her brother, Austin, in Amherst, MA. Their homes were nowhere near the pristine condition of Mark Twain’s. We wonder why, Amherst College. In a few short weeks I touched the same bannisters that some very famous authors held onto many years ago as they walked up the same stairs that I did. Was this the inspiration to submit a complete short story to my writing group–a story that is now receiving a major revision? I’m not even certain I like it. 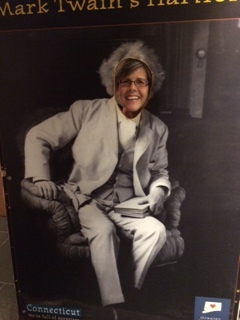 What would Hawthorne or Twain do–persevere or trash it?? I’ve always wanted to visit Moosehead Lake in Maine and we finally went there for one night. Waiting to check into our inn, we took a three hour boat tour on the Katahdin. Or so we thought. We happened to be there on the two days a month it is four and a half hours long….we were so ready to disembark when we finally docked at five p.m. I can check that off my list! On the medical front, I have a new oncologist–Dr. Ernstoff has moved on to the Cleveland Clinic. Because my mitotane level has dropped dramatically since May, I have upped the dosage from three pills a day to five. Unfortunately, at five pills I only feel well soon after eating. So I am eating what seems like continuously. Time for a trip to the outlets in North Conway…. Karen. I am one year since adrenal cortical cancer surgery at memorial sloane Kettering hospital in New York. Cat scans to date are clear. Adrenal insufficiency is a roller coaster to manage. Mitotane was a 6 month adjuvant therapy which I completed. Do you suffer with adrenal insufficiency and how are you managing? How gave scans been? Does your new doc support long term use of mitotane? Msk only supports 6months. I’m back. The nagging begins tonight. Write!